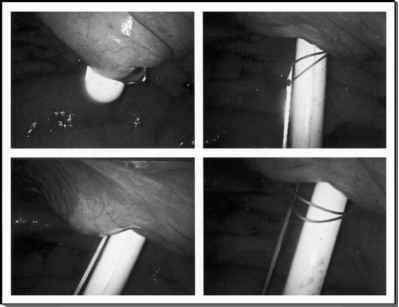 During closed transperitoneal access, a Veress needle is initially placed percutaneously into the peritoneal cavity, usually through one of the subsequent trocar sites (1). The standard reusable Veress needle is a metallic needle with a retractable protective blunt tip. The blunt tip retracts exposing the sharp end when the tip of the Veress needle is pushed against a tough structure such as fascia. Once the needle has penetrated the layers of the abdominal wall and enters the peritoneal cavity, the blunt tip springs back into place, thereby protecting the abdominal viscera from injury likely to be caused by the sharp edge. The Veress needle has a valve-operated port for initial peritoneal insufflation. The Veress needle is available as a disposable or a reusable instrument. 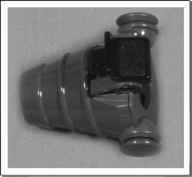 The 2-mm Minisite trocar™a, a modified Veress-type device, is the author's instrument of preference for obtaining closed peritoneal access. The Minisite trocar has a retractable blunt tip similar to a standard Veress needle, and can also be used as a 2-mm cannula by removing the inner trocar needle. In cases where the correct position of the needle is questionable, a 1.9/2.0 mm telescope can be passed through the Minisite cannula to confirm intraperitoneal position. For pelvic laparoscopic procedures, the patient is typically supine with a slight Trendelenburg tilt, and the Veress needle is introduced through a subumbilical incision. The needle is directed toward the pelvis in order to avoid injury to the great vessels. For upper tract laparoscopic procedures, the patient is generally in the flank position, and the Veress needle is placed through the iliac fossa in order to minimize inadvertent aU.S. Surgical Corp., Norwalk, CT. Many laparoscopic surgeons prefer the open Hass on approach to obtain initial transperitoneal laparoscopic access. FIGURE 1 ■ A Hasson cannula. FIGURE2 ■ PDB™ balloon dilator. Source: Courtesy of Autosuture. injury to the bowel, which typically gravitates medially toward the umbilicus. It is preferable to avoid a Veress needle puncture in the vicinity of a previous abdominal scar. The tactile feedback of the Veress needle passing through the various layers of the abdominal wall is critical in ensuring optimal positioning. Typically one feels two distinct "pops" each at the level of the external oblique/rectus fascia, and at the level of the transversalis fascia/peritoneum. The disposable Veress needles have a ball that visually confirms the "pops." After insertion, the Veress needle is aspirated to rule out the presence of blood or bowel content. The correct placement of the needle is further confirmed by injecting a few drops of saline, and demonstrating the rapid drop of the meniscus. Final confirmation is obtained by documenting a low opening intra-abdominal pressure after initiating insufflation at a low flow (1 L/min). Once the correct intra-abdominal position of the needle has been confirmed, insufflation flow rate can be increased to the maximum. Once the abdomen has been insufflated adequately (intra-abdominal pressure 15-20 mmHg), the primary trocar is placed. This author prefers to initially insufflate the abdomen up to 20 mmHg prior to inserting the first trocar. This keeps the abdomen tense and reduces the chances of inadvertent visceral injury during the first "blind" trocar placement. It is important to make a generous skin incision for the initial port-site to reduce the gripping of the skin on the trocar. Additional trocars are subsequently inserted under direct laparoscopic visualization thereby minimizing the risk of inadvertent visceral or vascular injury. Many laparoscopic surgeons prefer the open Hasson approach to obtain initial transperitoneal laparoscopic access (2). Herein, primary access is obtained through a 1 inch incision made at one of the port-sites. The incision is carried down through the various abdominal wall layers to reach the peritoneum. The peritoneum is then grasped between hemostats and sharply incised. A finger is introduced through the incision to confirm presence within the peritoneal cavity. With the open access system, it is of critical importance to obtain an airtight seal at the site of entry through the abdominal wall in order to minimize gas leak of the insufflate. A Hasson cannula may be used for this purpose (Fig. 1). The Hasson blunt-tip can-nula is inserted into the peritoneal cavity and secured in place with fascial sutures. The author prefers to use a blunt-tip balloon cannula (vide infra) in lieu of the Hasson can-nula since, in my opinion, the seal provided by the balloon port is better.